Amanda Murphy Design: To Market, to Market.. I'm still binding! But I'm excited about Market... if you will be there stop by and visit me in booth #1505, right across from Anna Griffin/Blend Fabrics. 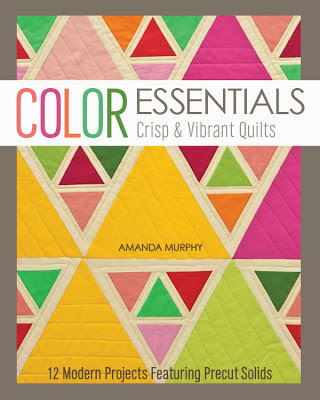 My new book Color Essentials, will debut this Market and I'll be bringing all of the projects to my Schoolhouse on 4:15 this Friday in Room 362D. We don't have enough books printed yet to have a book signing this Market but there will be giveaways, both of fabric and a few books, at the Schoolhouse. 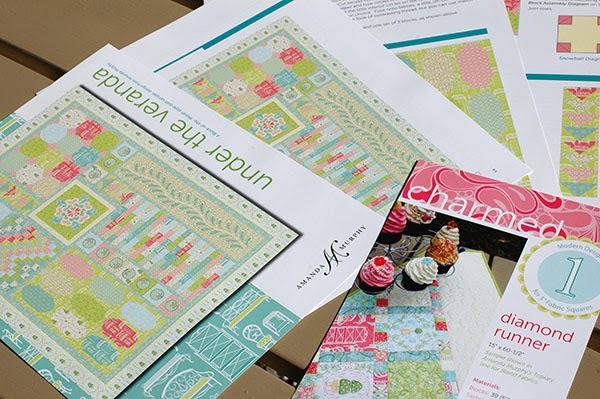 I'll have samples of my new collection, Topiary, and a couple of new patterns as well, including a block of the month available in print for the first time! They will be shipping in a few weeks. The color printouts make me so happy! You can also visit a special quilt of mine in Bernina's booth... more on that when I get back. And thanks to all of you who nominated me for the Embroidery category of Craftsy's Blogger Awards. This blog made it to the finals so if you get a chance I'd so appreciate it if you visited their site to vote. Have fun at Quilt Market! Safe travels, Amanda. Looking forward to hearing all about when you're back. It was great to meet and chat with you today. Thanks for the cupcake pattern for me to make something for my niece.